KUALA LUMPUR: Malaysia's Ambassador to North Korea, Mohamad Nizan Mohamad, who was declared persona non grata (PNG) by the North Korean government, is presently in Malaysia. Malaysian Foreign Ministry spokesman Raja Nushirwan Zainal Abidin said the ambassador who was recalled two weeks ago for consultations was still in Kuala Lumpur. "Yes it is true that our ambassador has been declared PNG. This reciprocal action is normal in diplomacy. "It should be noted that the Malaysian ambassador has been recalled by the government. He is presently in Malaysia and has been in Malaysia for sometime now," he said when contacted here tonight. North Korean Central News Agency (KCNA) today reported that the country has designated the Malaysian ambassador to the country as "persona non grata" and demanded the envoy leave the country within 48 hours from 10am on Sunday. The report came as the North Korean ambassador to Malaysia Kang Chol was declared PNG on Saturday and given 48 hours to leave the country after he failed to appear when summoned by Wisma Putra (Malaysia's Foreign Ministry). 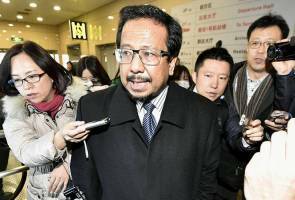 The decision was made by the Malaysian government as the envoy failed to apologise for making claims that Malaysia was conspiring with South Korea in investigating the assassination of Kim Chol, widely reported to be Kim Jong-nam, the estranged half-brother of North Korean leader Kim Jong-un, at the KL International Airport 2 (klia2) on Feb 13. Diplomatic ties between Malaysia and North Korea soured since then. Kang Chol left Malaysia from the KL International Airport (KLIA) at 6.35pm today on Malaysia Airlines Flight MH360 to Beijing. Meanwhile, Foreign Ministry secretary-general Datuk Ramlan Ibrahim said declaring Mohamad Nizan as persona non grata (PNG) was the right of North Korea. "It is their right, just as we declared the North Korean Ambassador as PNG. This is a practice of diplomacy, reciprocal treatment," he told Bernama when met at the ministry's get-together with representatives of the media here, tonight.